International A-Z: A for Algeria - Food, Drink, Photography, and other things. Earlier this year I was watching Saturday Kitchen and they were showing one of the many regular clips from Rick Stein. This was from a series he did in Eastern Europe and it gave me the idea to try to do another alphabetical cooking challenge. I intend to take each letter of the alphabet and cook something from a country or region beginning with each letter. Originally my plan was to cook a meal but we were recently at a barbecue where the husband was Algerian and his family had provided most of the food. There was a yellow bread which went down really well. When I got home I looked it up and found some recipes. I took inspiration from a recipe from food.com but I reduced the quantities a bit. Since the bread we ate didn't have seeds on or in it, I left those out. My bread took a long time to rise (I think there were problems with the yeast) and the bread had a slight sourdough taste to it. 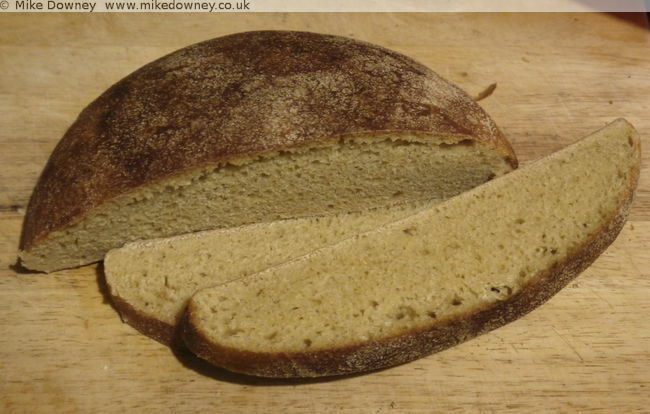 I had baked with semolina before but this was the first time I had done a bread which was mostly semolina flour. My version wasn't as good as the one we had at the barbecue but it was my first attempt. If I try again, with fresher yeast, it might come out better.